A 55-year-old man has been airlifted to hospital after being injured in an industrial accident in Dronfield, Derbyshire. He suffered a badly cut and partially severed index finger after being trapped under a metal bar. The incident happened last Friday, 24th January. 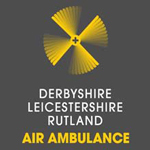 Derbyshire, Leicestershire and Rutland Air Ambulance (DLRAA) were tasked to the incident at approximately 12:29pm and arrived at the scene 20 minutes later. Upon arrival they found that the patient's injury had already been dressed and that analgesia had been given by paramedics from East Midlands Ambulance Service. They then proceeded to top up the analgesia and give him an IV antibiotic before flying him to the Derby Hospital Emergency Department. DLRAA provide treatment on the scene of an incident, and a rapid means of transport to the hospital most suited to the casualty's specific injury and illness.